I know it is a rumor but if a Booster Gold and Blue Beetle movie happens I will be doing a happy dance. The nice comic relief fun movie will make me so happy. I adore the Justice League International, I own a Showcase Collection of Booster Gold, I have the entire first series of Ted Kord Blue Beetle, so Blue and Gold being a movie makes me so happy. I’m having a mega nerd out over it right now. Pretty much I was bouncing off the walls in excitement. After doing my first podcast in awhile and hearing this story at the end of it, I am so giddy right now. You all have no idea how giddy I am right now. Though on a side note I did finally read all of The Autumnlands Vol. 1: Tooth and Claw tonight and I really dig it and I can’t wait to read more in the future of that series. I’m a huge Kurt Busiek fan anyway so that was awesome. Benjamin Dewey is amazing and Jordie Bellaire’s colors are phenomenal. Seriously if you haven’t read The Autumnlands yet, read it now it’s cool. You’ll dig it as it is one great read and compelling as all get out, I dig it a lot. Yes this is the ultimate late night chill bloggity thing as I’m a little tired as I write this so bear with me. I’ve got my amazon shipment on the way so that’ll be awesome. So many great books to read and talk about. I’m excited! I’ve got a movie I’ve been looking forward to for awhile hopefully in the works and a lot of good comics to read. I am one happy kind of guy as this night winds down. Sorry for the late post and it reading like I am a little tired that’s because I am. I wanted to get that last little bit of fun writing here on the blog before the night was out. Thanks for reading and thanks for putting up with a half asleep blog. Laters! As those of us reading the reports of what’s been going on at DC lately feared, yes five books are ending in December 2015. Those books are Justice League United, Lobo, Doomed, Gotham by Midnight, and The Omega Men. I’ve personally been reading Justice League United and Gotham by Midnight and it is such a shame. I was actually planning on getting into The Omega Men but sadly it is now ending. Oh man, it’s sad to lose your favorite titles. Yet I would say I have the biggest connection to Gotham by Midnight as I had been reading that from the start and really liked it. I did dig the first trade of Jeff Lemire’s run with Mike McKone on Justice League United and made a point to check out Jeff Parker’s run on JLU this week. Now I wonder with these cancellations, what is going to happen next for the rest of the series in DC You? I imagine right now many people are getting a little nervous about the future of their favorite DC You books. I’m curious in reading the next sales chart for August off of The Beat to hear more as to how things are faring. I know from looking at the July numbers for a lot of DC You titles it wasn’t pretty to see. It’s why I’ve been on my twitter today saying that if you got a book you dig, now would be the time to support it and tell your friends. Another piece of advice if you’re into a book and haven’t done it already, put it on your pull list. That way the store knows you want it and you’ll be getting it month to month. If you’re a digital comics reader, subscribe to the book on Comixology. Not sure how that impacts month to month sales but every little bit helps at this point. I say though, spread the word on your books and show your support to them. I feel like I’m repeating myself from the DC Rumors but now that the DC Rumors look like they’re coming to pass, it’s not a bad thing to restate. It’s a shame that five books are ending but hopefully with a little push we can stop more from getting cancelled. So if you have a book you like, don’t be shy and let people know. DC You has been a cool movement and I’d love to see it keep going. I don’t claim to have all the answers here I’m just doing my part from what I know. The time for action is now rather than later. In going through Marvel Unlimited and seeing what all they have I realize that DC Comics needs this kind of service in a big way. For a decent period of time I was a huge DC fan, I was buying about 90 percent DC Comics at one point. Now my buying is much more spread out but for awhile I was mostly a big DC fan. There’s a lot of Marvel I didn’t get to read and Marvel Unlimited has been huge in catching me up with periods of comics I missed. Heck there are books from the few years I didn’t read comics that I hadn’t gotten to read. Now with people digging Marvel Unlimited, why hasn’t DC Comics figured out a way to do this too? It would be amazing! DC has such a ridiculous library of books that people would be getting a DC Comics Unlimited style service day one. So many years of comics in the DC Library and it begs for DC Comics to get on the Marvel Unlimited style train. DC Comics has so many periods of comics to play with between the Multiverse, Vertigo Comics, and the main DC line, people could spend days in that. With Marvel Unlimited already people are spending time getting to know all the Marvel stories and people would do the same for DC Comics, it would generate so much interest. Considering DC has Batman V Superman, Suicide Squad, and more on the way, this would be perfect! People getting to learn more about the different characters involved in these movies. Easy way to get people hooked into Suicide Squad too. You have Arrow, Flash, Legends of Tomorrow, and Supergirl on TV and even more opportunities to get people hooked into a DC Unlimited style service, so much comic history! I hope one day that DC Comics does do an unlimited service. DC Comics Unlimited does have a nice ring to it, though I know they could come up with better. It would be so cool to see. The day DC does this unlimited style service I will be so excited because a DC Comics Netflix would rock on so many levels. Wow Jeff Parker’s Justice League United Run is a Blast! I’m having one of my comic book reading moments where somehow I missed a thing. I missed a cool thing. I’ve only read the first trade of Jeff Lemire’s run on Justice League United and dug the heck out of it. I’d been hearing about Jeff Parker’s run on the book and I read the preview talking about how it is using everyone and everything in the DC Universe. That intrigued me but didn’t totally sell me on it yet. I was reading other books too and this week with a few clearances in my pull list it was time to take the Justice League United plunge. Man alive was I rewarded with such a cool reading experience. It’s got that nice mix of unpredictability with anyone in the DC Universe able to be part of the team mixed in with endless weird. That is my cup of tea. Lots of weird, lots of fun, and a whole lot of unpredictability. It’s a nice amount of weird DC comics that you don’t see that often anymore. A superhero book that isn’t afraid to go into the realms of the strange and wonderful, heck yes Jeff Parker! The overall concept of Adam Strange being stuck inside a Zeta Beam and floating around with Alanna Strange running point for the team is cool. It’s how the concept of all these DC Universe characters come into play. Adam Strange can see the threats and uses Alanna to communicate those threats to the team. It’s how we learn of the Breakers and why they have to be dealt with. They’re able to break things in time and space and cause a lot of havoc. So many cool ideas and why the teams that come together are seemingly random but fit any given situation they get summoned for. When your first team is The Demon Etrigan, Mera, Poison Ivy, new hero Equinox, and Swamp Thing, it’s oddball but it works. They’re dealing with this new threat of the Breakers. Hence why the strange team I mention works. You see where the unique abilities of each member fits into the overall puzzle and ultimate solution to the battle at hand. It’s so cool and beautifully rendered, thanks to the amazing art team of Travel Foreman and Jeromy Cox. Drooling over gorgeous art, a new villain idea and inventive stories, I’m a happy reader right now. In #11 and #12 so many things happen and that’s what I love about this so far. Of course what got me curious about this was #13. DC and World War II stories are usually pretty strong. Adding in the Breaker concept into the mix and you get a good time. The team for this one is Vandal Savage, Stargirl, Steel, Robot Man, and Batgirl. Really random but already in this issue you see where they start to fit. By the way, I am a sucker for Vandal Savage in anything so him on a team for a short while makes me happy. So far so good and Paul Pelletier is a cool artist for this World War II adventure along with Rob Hunter’s inks and Jeromy Cox’s great coloring. Pelletier has always been an artist I’ve dug anyway so him on a WWII adventure already has me sold. I cannot believe I nearly missed out on Justice League United this time around but I’m in for the long haul. Sign me up for the rest of the journey immediately! Oh DC Comics, you are winning me over once more slowly but surely. The DC Comics Rumors and You: Support Your Books! You hear about DC Comics being on and in an instant it becomes time to get a little nervous on comics internet. When you start hearing the rumors about DC cancelling titles and going back to a quote “meat and potatoes” style of comics, I see why people get concerned. Comics are a weird beast and DC Comics lost money with Convergence as even in my own comic store they got stuck with a lot of books. Then DC revealed the DC You movement and it piqued interest initially. DC Comics has burned a lot of fans though as the DC 52 rolled on and Convergence did an even bigger number on fans. DC You though has created good buzz for most of the line and in reading them I find that they’re all solid to great books. Yet it is not translating to sales as I research into this further. You get a lot of interest in #1 then tumbling down brutally as #2 hits. Usually there’s always a slight drop with #2 with a book but this is brutal to behold, which makes me wonder, what the heck happened? Well for a lot of people it is DC Comics burn out. In dealing with DC Comics you realize that many readers got battle scarred from what they’ve done. As they’re moving forward in an overall stronger direction I feel as though people are still gun shy about DC Comics. This is why I’m saying if you’re out there reading this, support your books now. If you got a series that you’re digging talk about it as much as humanly possible. Talk up those books that you’re digging and get people curious about them. If you’re wondering which books to check out and since it mirrors my list of books check out Comicosity’s list of DC You books. I would say most of the books I’m reading are on this list and they are books that I can easily tell you to support. I’m linking the sales info below too as I want you all to see for yourselves why I’m posting this. The best way to understand a lot of these rumors and what’s going on further is to look at the sales. It’s a time at DC Comics where things could be on the verge of being pretty cool and I’d love it to stay that way. Check out the Comicosity list of books you might dig, see the sales, and talk up your favorite books. Thanks for reading and if you have any comments feel free to fire me a line below. Take care everyone and support your books! Recently my local libraries had a massive upgrade as to what books they carry graphic novel/tpb wise. I found a diverse and downright impressive collection of books. Hence starting a new series for me here on the blog. As I got a massive pile of books the first one I decided to read was Batman: The Dark Knight Vol. 2: Cycle of Violence. I read the first volume of this ages ago and it was okay. Outside of Scott Snyder and Greg Capullo’s Batman I’ve not read a lot of Batman’s New 52 adventures. Hence why I decided to grab Vol. 2 with Vol. 3 to see more of what I missed from Gregg Hurwitz on this series. Hurwitz’s run has gotten a bit of acclaim so as it is the library, why not give it a go? There is nothing wrong in life with taking a chance on reading more of a series; especially from your local library. Anyway enough of the intro, let’s start up this Bat-tacular and see where it takes me. Now Batman: The Dark Knight Vol. 2: Cycle of Violence is mostly stand alone from everything else. If you aren’t up to date on the Bat-Universe, this would be a story up your alley. I can appreciate the way Hurwitz did this story as it does require little to no previous Batman knowledge. Take note before diving into this, this is almost borderline mature readers territory. If you have a kid who may be wanting to read Batman, I wouldn’t recommend this. I give Hurwitz credit here as he pulled no punches with this story so for a teenager and on up; this is a perfect story. Hurwitz manages to write one of the creepier Scarecrow stories out there. There’s even rare moments where you can actually understand the Scarecrow. Hurwitz dives into the backstory of Scarecrow and managed to terrify me a couple times. Not easy to do by the way to actually make my eyes widen in shock, Hurwitz did this. The Bruce Wayne segments with Natalya, Bruce’s girlfriend in this story, slow down the story a touch but they’re not bad either. They lead off to strong moments later on but they’re mostly tension break moments to balance the story. I do like the payoff of those scenes as they all contribute further into the focus of the story, fear in multiple forms. It’s a pretty multifaceted story diving into the fears of Batman and everyone in his life. Now that being said the fear exploration worked and didn’t work depending on the phase of the story.It’s also a vivid way to explore the Scarecrow and his alter ego Jonathan Crane. By the end of this story you’re going to understand the fears of our characters in ways you wish you didn’t know. As I said some fall flat but when they work, they’re haunting and beautifully done. Here’s where things get more hit or miss with me, David Finch’s artwork here. In any sections where there was action involved, he was spot on. He’s great at translating the mood of Hurwitz’s scripts too. I loved his art on the Scarecrow, that was terrifying and the imagery involved won’t leave my head anytime soon. Overall Finch’s storytelling for The Dark Knight was solid. Just I learned that I am not big on how Finch draws his faces. If it’s Bruce Wayne, Batman, Gordon, and Scarecrow, the faces and designs look amazing. A lot of other characters suffer from stiff face syndrome as it looks as though all the life was drained from them. That bugged me more than anything else. Everything else art wise from Richard Friend’s inking to Sonia Obach’s coloring looks good overall. The curse of David Finch’s artwork as it does suffer from uneven moments but when it’s on, it looks great. The #0 issue in the Cycle Violence collection is a different take on the Joe Chill and Bruce Wayne’s parents death story. It was a good way to place this story as it expands upon concepts Hurwitz brings up in his story. I found myself liking this story way more than I thought I would. The death of Bruce Wayne’s parents is one that’s been retold by many creators, this one is good though. Heartbreaking on the levels of Bruce Wayne’s suffering and also why their deaths happened in the first place. Hurwitz did a nice job conveying the absolute pain Bruce Wayne went through. I almost call it a mini version of Batman Begins. It didn’t hurt that Mico Suayan and Juan Jose Ryp did a good job art wise on this story. I would say #0 was a perfect way to close out this collection. Now if Batman: The Dark Knight Vol. 2 was in front of me to buy would I buy it? This would be one I could buy if it was at a discount somewhere. It was a good story but not so much that I’d go out of my way to own this collection. I will say if you’re huge into Batman, you may want to give this a shot. Especially if you’re curious about this take on the Scarecrow, it’s unlike anything else out there. If you’re at your local library and see this on your shelf, check it out. Uneven at times but I must say that this was a solid read. Brutal honesty moment here for you all, I only read one issue of Forever Evil. One single issue of Forever Evil was all I could handle because I did not like that book. As Forever Evil hit just after the Trinity War series I did for Comics Crux maybe I’d look into expanding into Forever Evil. Even Trinity War had managed to at least do enough to get me interested in reading more. After that one issue I just couldn’t read any further into the series. I kept loose tabs on Forever Evil but nothing more than that. Barely paid attention to the whole hooded prisoner or anything else involving the series. Forever Evil did a number in killing my interest in DC after the slight high I got after finding myself enjoying Trinity War by the end. Now I’m reading about the aftermath of Forever Evil #7 and you know DC may have more potential after the event than when it was happening. Let’s go for the fun appearances, Ted Kord officially in the New 52. Oh my sweet lord that made me smile. Any chance of me getting the Ted Kord Blue Beetle back and somehow Booster Gold in the picture again makes me smile. I’m an old school Justice League International fan and love the Blue and Gold combination of awesome. Even better that there’s the concept of Lex Luthor as a good guy in the picture. He’s learned Bruce Wayne is Batman. Yes, Lex Luthor knows Bruce Wayne is Batman in the New 52. That is crazy but cool at the same time. You may also be surprised to find out that I actually am hyped for the Grayson book, the concept intrigues me. Of course the one major piece of fallout from Forever Evil is what may get me checking DC Comics on a more regular basis, say hello to the Anti-Monitor. People had been wondering what DC Comics was going to do next year for the 30th anniversary of Crisis on Infinite Earths. Bringing the Anti-Monitor back in play is a major push towards the future of the DC Universe. I don’t think that this is a sign that the old DCU is making a comeback, this is likely a setup for the Earth 2 weekly and Future’s End. Putting Anti-Monitor against Darkseid is an attention getter for me. For the first time in a long time I feel as though stuff is happening in the New 52. Not just here’s one event, here’s another event, oh look at that another event, and now an actual something to grasp onto. I’m amazed, I’m legit amazed that somehow in the midst of Forever Evil that DC is starting to find a groove. 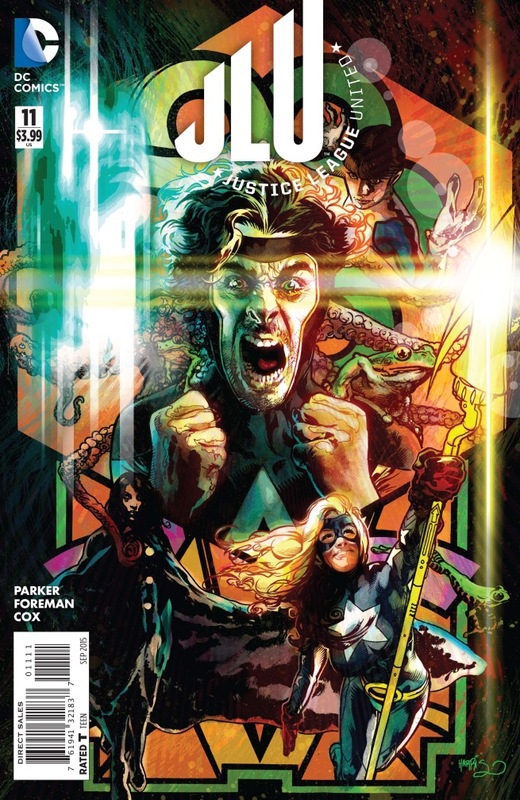 If Forever Evil’s biggest success manages to create interest in the New 52, they may have succeeded. This is the first time in a long time I’ve actually been wanting to see more of DC Comics. All I can say for DC Comics going into the rest of this year into 2015, don’t screw this up. Keep up this wave of excitement and energy in your line. If you manage to screw this up, I don’t know what to tell you. Go big or go home DC Comics because at this point, The New 52 needs this spark of life in the worst way possible. Crisis in the New 52 has a nice ring to it don’t you think? Update: If you want to know more of the beats of Forever Evil that I didn’t catch check out @Jawiin’s video he did on the event. He did a great job with it.